Britain’s royal family gathered Friday for another wedding, this one the union Princess Eugenie and Jack Brooksbank. The exchanging of vows took place less than six months after Prince Harry and Meghan Markle's high-profile wedding, and in the same chapel where the Duke and Duchess of Sussex wed in May. Brooksbank, 32, mouthed, "You look perfect," to Eugenie, 28, as they tied the knot at St. George's Chapel at Windsor Castle. 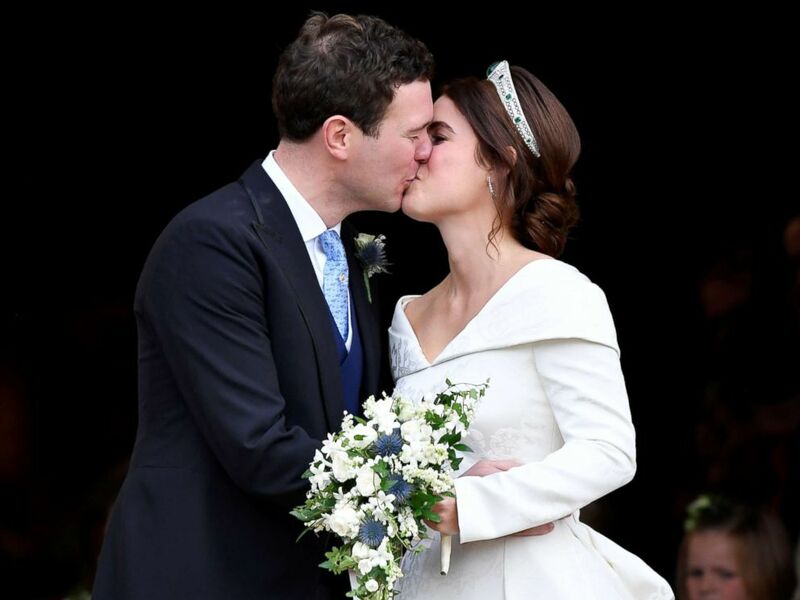 Princess Eugenie and Jack Brooksbank kiss after their wedding at St George's Chapel in Windsor Castle, in Britain, Oct. 12, 2018. Eugenie, a cousin of Prince Harry, is the younger daughter of Prince Andrew and Sarah Ferguson, the Duke and Duchess of York. Jack Brooksbank and Princess Eugenie after their wedding, Windsor, Berkshire, U.K., Oct. 12, 2018. Prince Andrew escorted his daughter to St. George's Chapel in a 1977 Rolls Royce Phantom VI. Princess Eugenie of York, left, arrives with her father Prince Andrew, Duke of York for her wedding with Jack Brooksbank in St George's Chapel, Windsor Castle, England, Oct 12, 2018. Ferguson, in her role as mother of the bride, wore a green dress designed by local Windsor company Emma Louise Design, a green hat with gold accents and a vintage Manolo Blahnik bag carried by her own mother at her 1986 wedding to Prince Andrew. Eugenie's older sister, Princess Beatrice, wearing a blue dress by Ralph and Russo and a hat by Sarah Cant, served as her maid of honor and delivered a reading from "The Great Gatsby" during the ceremony. Brooksbank's brother, Thomas Brooksbank, served as best man. Famed tenor Andrea Bocelli was among the musicians providing music for the service, including a performance of "Ave Maria." 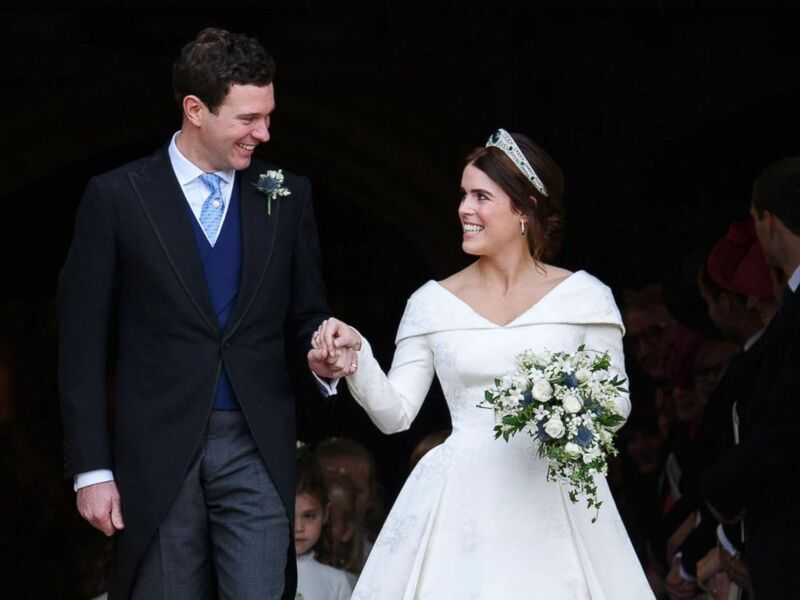 Eugenie chose U.K. designers Peter Pilotto and Christopher De Vos to design her wedding dress. Pilotto and De Vos founded the British-based label Peter Pilotto in London in 2007. Eugenie met the designers when she was co-hosting an event in support of women artists, according to Buckingham Palace. Princess Eugenie arrives accompanied by the Duke of York, at St George's Chapel for her wedding to Jack Brooksbank in Windsor Castle in London, Oct. 12, 2018. The fabric designed for Eugenie's dress -- complete with a fitted bodice and full pleated skirt -- includes a number of symbols. A thistle for Scotland represents the couple's fondness for Balmoral, the royal family's Scotland estate. A shamrock for Ireland is a nod to Eugenie's mother's family and a york rose and ivy represent the couple's home, Buckingham Palace said in a statement. 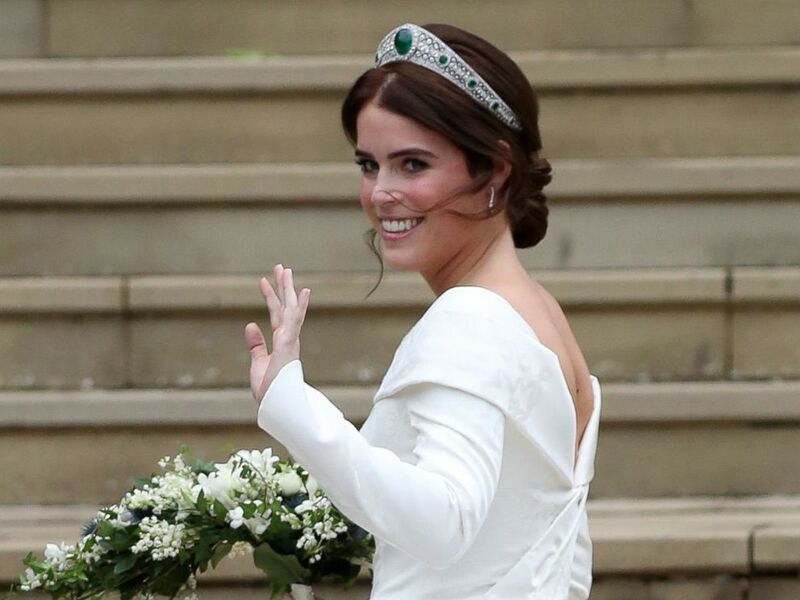 Princess Eugenie‘s low cut in the V-shaped back of her gown revealed the scar she had from surgery related to scoliosis at age 12. Eugenie is Patron of the Royal National Orthopedic Hospital. 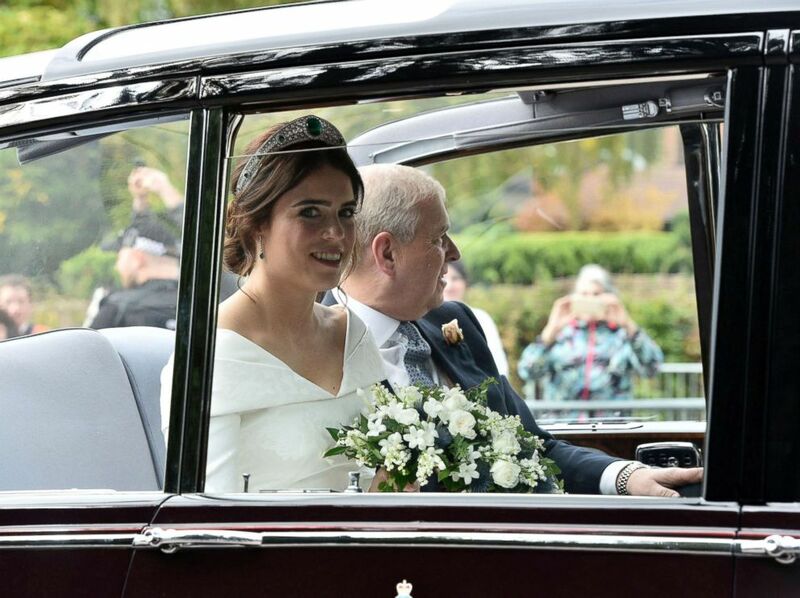 Britain's Princess Eugenie arrives accompanied by her father Prince Andrew, Duke of York, at St George's Chapel for her wedding to Jack Brooksbank in Windsor Castle, Oct. 12, 2018. Eugenie's stunning tiara, the Greville Emerald Kokoshnik Tiara, was lent to her by her grandmother, Queen Elizabeth II. Britain's Princess Eugenie of York at the West Door of St George's Chapel, Windsor Castle, in Windsor, Oct. 12, 2018, for her wedding to Jack Brooksbank. The bride's diamond and emerald drop earrings are a wedding gift from Brooksbank. 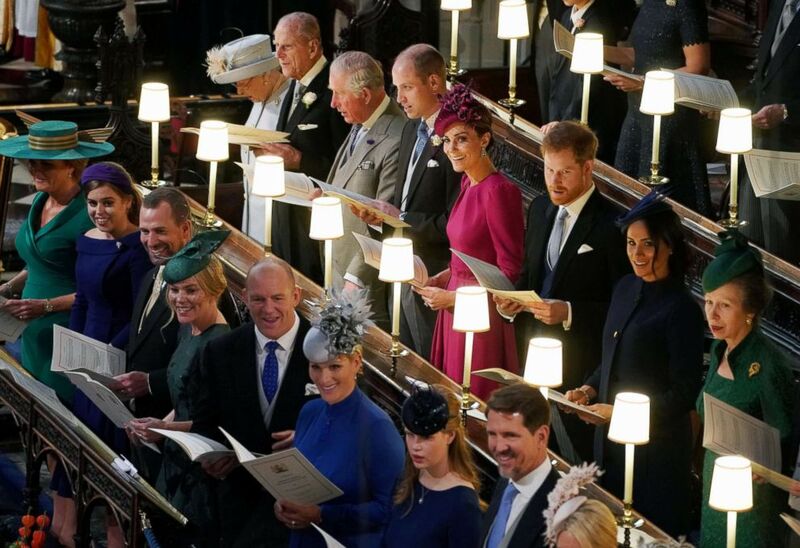 The Duke and Duchess of Cambridge and the Duke and Duchess of Sussex arrived together for Eugenie and Brooksbank's wedding. Duchess Meghan arrived at St. George's Chapel, where she wore a Givenchy wedding dress as the bride, in a navy blue coat dress by Givenchy and a hat by Jane Taylor, a London milliner. Princess Kate stood out in a deep pink Alexander McQueen dress and a hat by Philip Treacy, a favorite milliner of the royal family. The Royal family at the wedding of Princess Eugenie and Jack Brooksbank at St George's Chapel in Windsor Castle, Windsor, Britain, Oct. 12, 2018. Queen Elizabeth, wearing a dress by Angela Kelly and a light blue hat, and Prince Philip were escorted right to the chapel door. 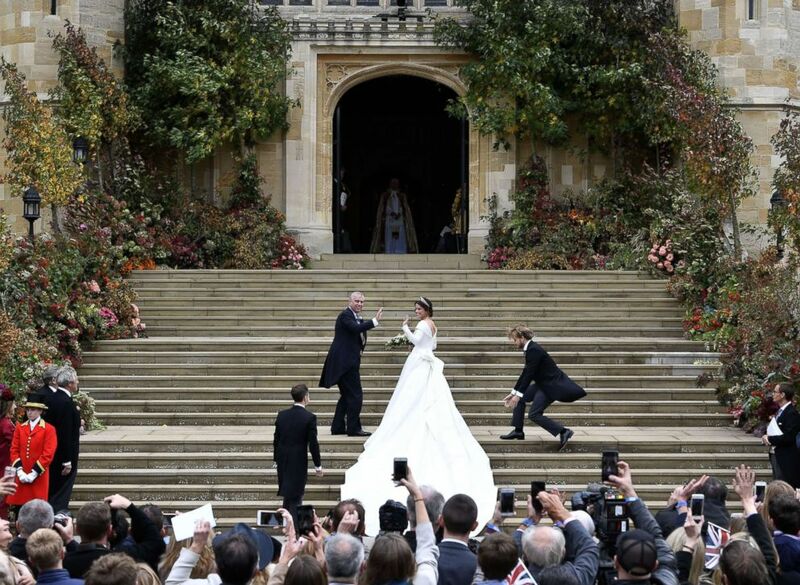 The more than 800 invited guests at Eugenie's and Brooksbank's wedding also included celebrities like Demi Moore, Naomi Campbell, Kate Moss and Ricky Martin. Princess Kate's siblings, James Middleton and Pippa Middleton Matthews, also attended the wedding. Middleton Matthews, who is nine months pregnant, wore a forest green dress. 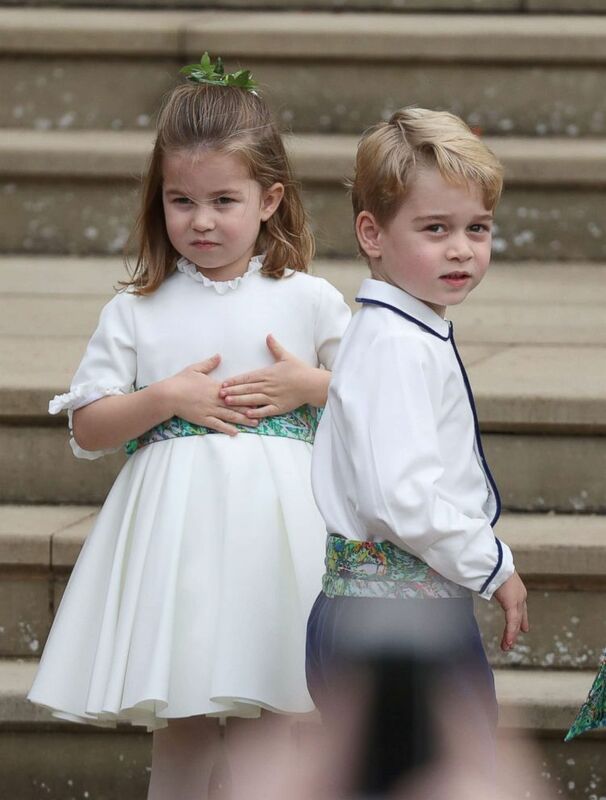 Prince William's two oldest children -- Prince George, 5, and Princess Charlotte, 3 -- served as page boy and bridesmaid, respectively. Princess Charlotte and Prince George arrive for the wedding of Princess Eugenie to Jack Brooksbank at St George's Chapel in Windsor Castle, Britain Oct 12, 2018. 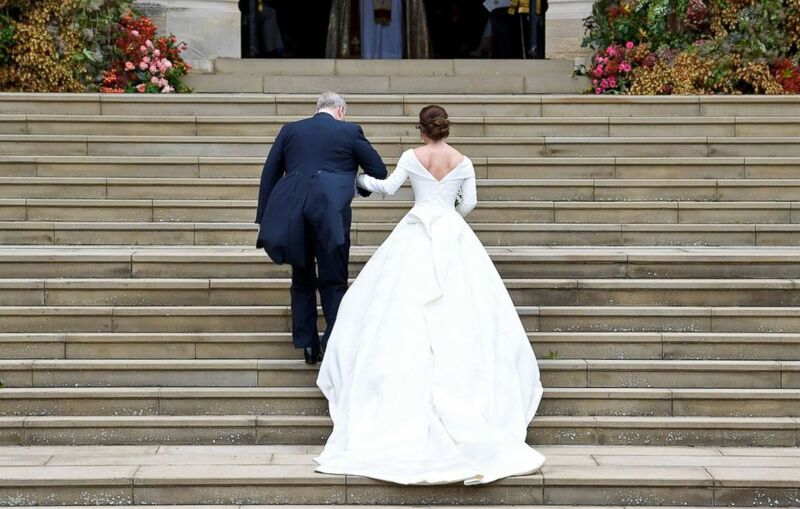 George and Charlotte waved as they made their way up the steps of St. George's Chapel, the same steps they walked as page boy and bridesmaid in Harry and Meghan's wedding. 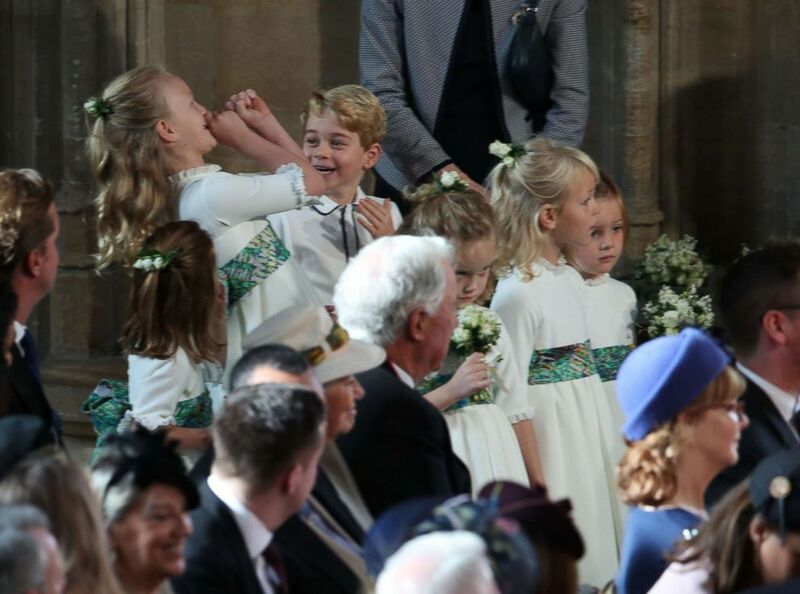 In addition to George and Charlotte, the bridesmaids and page boys include Savannah Philips, 7, and Isla Philips, 6, the daughters of Autumn and Peter Phillips; Mia Tindall, 4, the daughter of Zara and Mike Tindall; Maud Windsor, 5, Eugenie’s goddaughter and the daughter of Lady Frederick Windsor and Lord Frederick Windsor; Theodora Williams, 6, the daughter of Ayda Field and pop star Robbie Williams; and Louis de Givenchy, 6, the son of Zoe and Louis de Givenchy. The page boys and bridesmaids were escorted by Lady Louise Windsor and her brother, Viscount James Severn, Eugenie's cousins and the children of Prince Edward and Sophie, Countess of Wessex. The bridesmaids and page boys wait to take part in the wedding of Britain's Princess Eugenie of York to Jack Brooksbank at St George's Chapel, Windsor Castle, in Windsor, on Oct. 12, 2018. The bridesmaids and page boys uniforms were designed by Amaia Arrieta of Amaia Kids. The design incorporates artwork by American artist Mark Bradford that was included in the wedding ceremony's Order of Service. More than 1,000 invited members of the public joined the celebration on the grounds of Windsor Castle, in addition to representatives of charities supported by Eugenie and Brooksbank, children from two U.K. schools Eugenie attended, Windsor locals and members of the Royal Household staff. After the ceremony, the newlyweds took a carriage ride out of Windsor Castle, on a path accessible to the public. Eugenie and Brooksbank rode in the Scottish State Coach, which was remodeled in the late 1960s on Queen Elizabeth's instruction to create a coach specifically for Scotland, according to Buckingham Palace. After the carriage procession, Eugenie and Jack's wedding guests gathered at Windsor Castle for a reception hosted by Queen Elizabeth. The couple will have a second day of festivities to celebrate their nuptials at Royal Lodge, Prince Andrew's royal residence on the grounds of Windsor Castle. In a departure from royal tradition, the couple chose a red velvet and chocolate wedding cake. 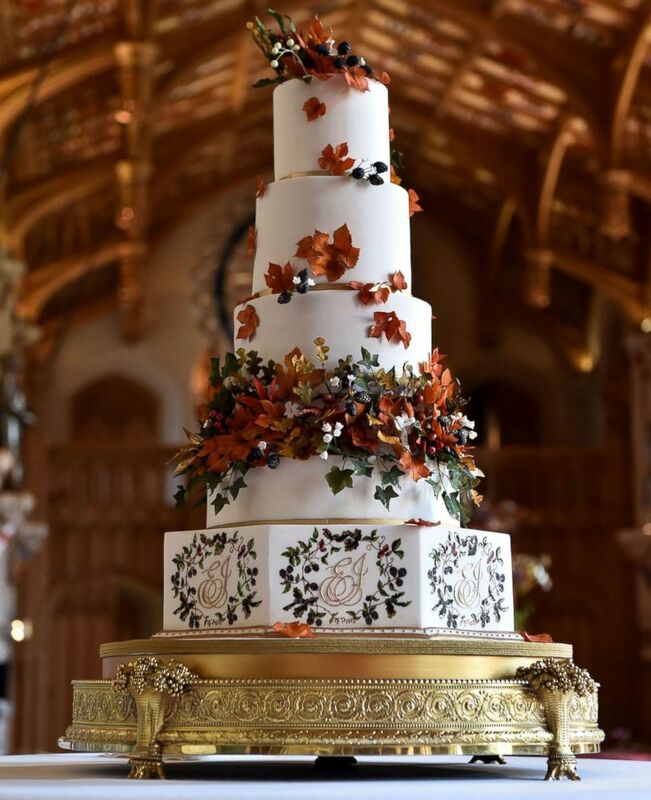 The wedding cake, which was created Sophie Cabot for the wedding of Princess Eugenie of York and Mr. Jack Brooksbank pictured in St. George's Hall at Windsor Castle, Oct. 12, 2018, in Windsor, England. The cake designer, Sophie Cabot, came to the attention of Princess Eugenie through her involvement with The Duke of York’s Pitch@Palace program, which recognizes and highlights new business innovation and entrepreneurs.